Hey, ya’ll! For awhile now, Marissa of Inspired Owl’s Corner has been brightening my Instagram feed with her adorable owl creations for teachers. If you love owls, you MUST read this post and follow Marissa in every way possible! She has so many owl resources you will absolutely love! “Hello! I’m Marissa from Inspired Owl’s Corner and I’m honored and excited to be a guest on Tabitha’s fabulous blog! I teach third grade in California, and I have taught 7th, 5th, and 3rd, in that order. I have been following Tabitha on Instagram for some time now, and I am always amazed by her presence in the teaching community. Teachers like Tabitha have inspired me the most in the past three years or so, since I stumbled upon my first teacher blog. Teachers who freely give away their ideas and products and encourage others to be the absolute best teachers they can be are the ones who have inspired me along my teaching journey. Like many other teachers, I felt a strong desire to give back and join this wonderful community of creating, sharing, and blogging. So four months ago, Inspired Owl’s Corner was born. I have been teaching for 18 years and am as passionate about it as the day I began. To me, teaching is more of a hobby than a career. I have always tried to find ways to make learning fun and engaging for my students, even during the height of standardized testing pressure and budget cut backs. Instead of giving my students a worksheet, I would often turn it into an engaging experience and we would play Jeopardy or use the Eggspert or Answers Buzzers and white boards to practice the concept. I have also enjoyed scrapbooking my girls’ childhoods, so creating items for my classroom and others’ has become a perfect alternate hobby for me. A good friend asked me to make some printables using digital clip art for her son’s dinosaur birthday party, and that sparked my desire to create things for my classroom. I love it when I pass out the centers and games I have created and my students say, “Awe, this is so cute!” I especially love those magical moments when they are having so much fun that they have no idea they are learning, until they have a completed recording sheet to prove it. Creating a fun, engaging environment for my students is a win-win for all of us! I enjoy creating centers, games, holiday-themed homework passes, thank-you cards, and other fun classroom printables. Owls have played a starring role in many of the products I create. I love them for their wisdom and cuteness, and they have made their way into my classroom and my heart. 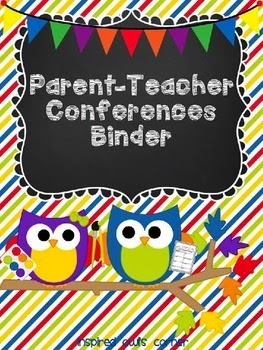 I have created a Parent-Teacher Conference Binder file for you here. Included are pre-made, as well as customizable binder covers, section dividers, and a few versions of the conference form I use. I feel it is so important to not only report grades and test scores for each subject to parents, but to make them aware of exactly how their children are progressing within each subject. Parents have expressed to me how much they appreciate my conference form, and I wanted to share it with you. I hope you are able to use it and find it helpful. I would love for you to visit my blog, Teachers Pay Teachers Store, and Instagram for other ideas and freebies.